As with almost any other type of floral display you can create the question basically boils down to two distinct pathways – to either juxtapose several different things or mostly keep things sparse with one particular species. Naturally, the direction you end up taking will largely depend on exactly what your needs are and what you have available. For instance, if you have some splendid orchids there’s probably no need to further clutter things up, but to rather let the flowers themselves breathe their elegance in the space of your vase. Again, here we have an important factor (what you’re sticking the flower in) to consider. 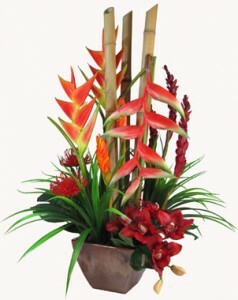 Some people prefer a simpler housing, perhaps a bit traditional like stone or clay, but there’s also something to be said about region-specific arrangements which might make use of wooden or bamboo-shaped containers which might further elucidate the area where your flower originally hails from. 1. Visualize a shape of the arrangement first. Don’t just start slinging plants into a vase; choose between a basic ball or pyramid-style shape (among others). 2. Stick with a single flower placement then move on to the next. One of the big amateur mistakes that people step into time and time again is trying to bunch up a group of flowers and then smash them into a pot together. Not only does this limit your ability to expertly place them strategically, but it just doesn’t make sense in the long run. 3. Your biggest flower should be most prominent and firmly grounded at the root of the arrangement. For obvious reasons you want the largest flower you are using to be solidly grounded, and this also applies to the basic design concept as well. 4. Fill up the spaces with something. While you could in theory fill up an entire arrangement with greenery and then place your flowers, the exact opposite is usually what is recommended. Moreover, the flowers should obviously bloom above where the greenery protrudes (it’s really just a quick background filler). Who says you have to go big and tall, eh? 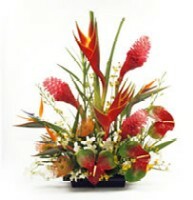 You can make absolutely stunning and beautiful arrangements with a variety of large blooming tropical flowers that are all roughly within the same colour palette. Lilies, roses, gerberas, pin cushion protea, equisetum and other inclusions make for great small and tight basket-based arrangements. Moreover, these types of offerings tend to remain fairly easy to care for and are much less prone to incidents of being “knocked over” by unsuspecting parties and so forth. The main thing to keep in mind of course is the colour arrangement(s), some of the more typical groupings being based on things like reds, oranges and yellows. 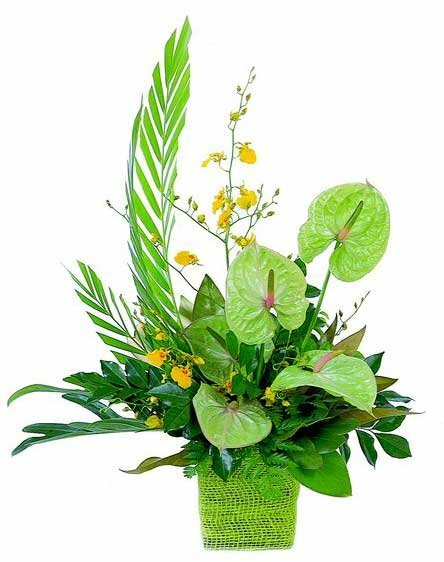 Tropical flowers are also great for creating eye-catching tall or “lanky” types of arrangements, especially considering that there are a few varieties which yield exactly the right height required. 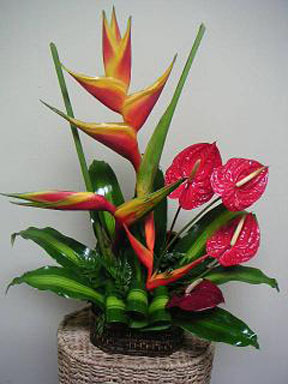 Again, this might include orchids or lilies, as well as pink ginger, roses, or even climbing varieties of multi-point blooms delicately separated and attached to some type of centrepiece. With taller styles the tendency is to keep things within a relatively simple or limited colour palette too. For instance, if there are purples and whites then perhaps greens and bamboo would be used to shore out the rest of the setting. Likewise, there are an almost infinite number of ways you can balance out an arrangement, wit some people adding a base of larger multi-bloom flowers with orchids or lilies springing up above it. Sometimes it’s best to just find a series of interesting and useful vases / bases to work with and begin stylizing your bouquet from there. This is especially true if you have a number of extremely characteristic pieces to work with as well as a large assemblage of tropical flowers to draw inspiration from. In such cases you can often stumble across some great design that might have otherwise slipped your mind entirely. Additionally, the size and scope of the vase will likely determine the overall shape as well, which again might either limit or expand your options (depending on what’s on hand in the way of flowers). Perhaps one of the easiest and most versatile tropical arrangements you can piece together involves any decent sized vase, any single colour of hibiscus and some accompanying greenery. You need only arrange it in a sort of inverted pyramid shape, remembering to space out the flowers so that they’re not bunched together and fill up the spaces with greens. Once finished, you’ll be left with a nice table-ready arrangement that’s sure to grab the attention of your dinner guests. No one is saying that you have to keep it simple however; you can also elect to place a number of different pots outside an entry way or in an exterior walkway, each one assuming a different height or level. There really aren’t any rules here as long as each individual species is in its own planter, moreover you can also move around too, experimenting with placements and caring for those that need it in a pinch.